Passion is a powerful force in accomplishing anything you set your mind to, and in experiencing work and life to the fullest extent available. An example is of these passionate boys who believe in things they do, and stand by it, even if it means failing. This duo Mr. Ayush Varshney known as the 'TechGuy' and Mr. Sahil Baghla known as the 'DizGuy' are both from IIT Kanpur, Electrical Engineering stream. Ayush's most of the time at college, post 2nd year, was spent handling technology for bluegape. "I used to travel to Delhi on Friday nights and return on Monday mornings to attend classes/quizzes," says Ayush. "Even though I was just starting with my 2nd year back then, I had made some name in coding/programming for the web in IIT-K. So, one day, Sahil who was then in 4th year, calls me up and says he wants me to create a website for him. Now coding was something that I would do when I was bored/happy/sad/angry/anything at all; so, I agreed," Ayush narrates the ignition of this duo to come together. "We soon incorporated our company as Bluegape lifestyle Pvt. Ltd., in December, 2011. It took one month for all this and INR 50,000 (big amount back then) which we took out from our savings and scholarships. I had completed the necessary coding and technical design of the website by then. So, our payment portal was also ready in no time. Next, we launched Bluegape nationwide," narrates Ayush. Bluegape is a team of young enthusiastic people who bring 'Socio web techno vibe' required to do online distribution of a brand's merchandise. The team at Bluegape esigns, manufactures and help the distribution. Bluegape has raised funding through an online platform LetsVenture.com which brings together investors from across the globe, much like the well-known AngelList. The Delhi-Gurgaon based company received funds of over INR 1.5 Cr from global investors who connected with the founders through the online funding platform. "We raised this round from eight different angels at LetsVenture, which is way different from how usual funding happens in India. Out of those eight investors we haven't met five. These angels showed their interest to invest in Bluegape by looking at a profile and a video pitch of Bluegape at LetsVenture. After that we had a phone call of one hour with each of the angel and they decided to invest. Investors have invested from INR 2 Lakhs to INR 40 Lakhs each. We closed the round with one of the investors within 7 hours just because he (US investor) was assured, for he saw that 6 people had already shown trust in the company, on LetsVenture." says happily Mr. Sahil Baghla, Co-Founder & CEO of Bluegape. Bluegape received the first round of seed funding of INR 10 Lakhs from Times Internet Ltd. (They were incubated in TLabs). This is a two-and-a-half year-old startup which came out of a dorm room at IIT Kanpur, in August 2011. They started off by selling personalized posters and have since pivoted several times in search of the perfect business model. 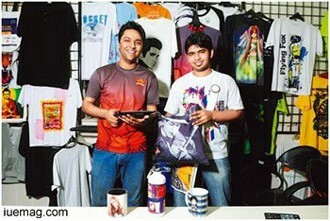 Finally, they realized that people are creating the products they love, be it Messi, Avril or Sachin. Why not just grab their rights and give people ready to pick stuff. This is the concept of fan merchandising. Since then Bluegape has sold fan merchandise for films such as 'Krrish3' and 'Batman' and several online phenomena like 'Guddu and Gang', 'IIT Tips', 'We and Football' etc. Recently, the website gained super traffic and traction due to the launch of the AAP (Aam Aadmi Party) store. "We've observed a 500% increase in the site traffic after the launch of the store. AAP fans are really passionate about it and word-of-mouth is spreading very fast. If the trend continues, AAP fan store and merchandise would be viral very soon," says Ayush Varshney, CTO and Co-Founder of Bluegape. About the latest round of funding, Ayush says, "We are trying to develop a supply chain for products which can be printed/customized on demand. This would help us in moving forward towards our vision which states - 'Starting a fan store is as simple as starting a facebook page'. Right now we have posters, mouse pads, t-shirts, laptop skins, mugs, fridge magnets, coasters and wall clocks in this category. Funds from this round would be used to create technology to automate the fan store creation process and increase the range of products in this category." The funding was completed within two months with investors from US, Ukraine, Singapore and India participating in the round. Generally, the timeline for raising funds in India is five to six months which involves lot of cumbersome procedure. But, in this case, LetsVenture took care of the financial and legal side of things and the due diligence. On talking about future ideas, Ayush shares, "We are in the process of launching a lot of apps for our sellers' platform, wherein the user can directly pull in content from their twitter profile, images from Instagram/Flickr/Facebook, content from blog and much more. Using these, they can quickly create products and launch their fan-store." The deal might have just changed the whole investment landscape in India. LetsVenture has already grown to 200 global investors and 250 startups and it would do the country a big service by making the AngelList-style funding mainstream in India. "Startup struggle does not end at series A, or B or even after acquisition. It only ends when one quits. For any startup, at any stage, team is always more important than money," say the dynamic duo.